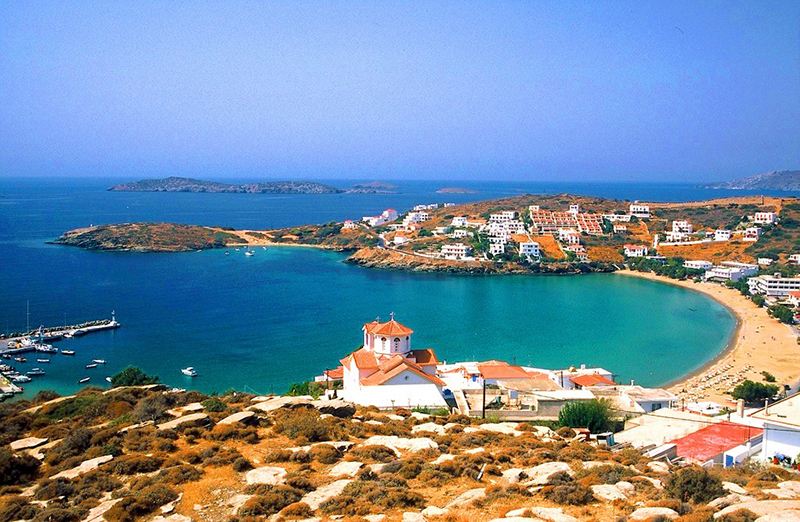 Andros holidays is a popular option for many travelers who want to explore Cyclades islands. Andros Town, Batsi, countless beaches and small villages, will make you keep Andros in your heart forever. It is the greenest island in the Aegean, as it features waterfalls, green canyons and slopes full of vegetation. Even if you spend your holidays in Athens or another island nearby, you should visit Andros at least for a weekend trip. Looking for accommodation in Andros? Check out Luxury Holiday Villas in Andros! Relatively close to the port, you will find “Felos” beach, sheltered from winds, sandy, and enough trees offering shade. It is ideal for your first swim on the island. However, the beast beaches lie a little bit further north. They may be not easily accessible, because of the dirt road connecting them, but it is worth swimming in their waters. Two of them are “Pyrgos”, “Vlychada” and “Kaminaki”. “Pyrgos” beach features an imposing Venetian Tower on its northwest side. “Zorkos” beach, one of the best beaches of the island is further north. It is ideal if you are looking for something more isolated and lonely where you only hear the sounds of waves and wind. The water in the shades of turquoise will make you feel like you’re in a cove of the Caribbean. If you like adventure, rocks form many caves which you can explore. A little further south, you can visit the beautiful beaches of “Vitali” and “Vori”, and of course… “Ahla”. On the east side of the island is Andros Town, with two really popular beaches, “Nimborio” and “Paraporti”. Finally, the most popular beach of the island is “Batsi”, which is also famous by the film “Girls in the Sun”. This organized beach is constantly crowded and features restaurants, cafes and beach bars. Andros Town does not feature the typical style of a capital of a Cycladic island. Despite its cobbled streets and traditional houses with blue windows, it has a stately, Venetian aura from a bygone era. The neoclassical buildings with green yards are representative of this era. The cultural element is really active with its many museums, dominating with their classic architecture. The highlights of Andros Town is “Kairis Library”, “Empeirikeion Gymnasium” (the poet Andreas Embirikos had origin from Andros) and the impressive Cathedral of the Assumption. Of course there are numerous cafes and restaurants, as well as many shops with special local pastries. In Andros Town, you will never be bored and will happily get lost in the alleys. Batsi is a traditional village, so beautiful, that, even when you are there, it gives the impression that you are in a cart postal. During the night, the heart of the nightlife of the island beats there. Around it, there are really pretty villages such as “Aprovato” and “hidden” beaches, such as “Anerades” and “Agia Marina”. So, it satisfies not only those seeking intense nightlife, but also those seeking peace and relaxation. Korthi is one of the places you should visit during Andros holidays. It is the southern center of the island, in a fertile valley with an impressive gorge and flowing waters. There, stands the Castle of Faneromeni, an old medieval fortifications with impressive views of the Aegean Sea. In Korthi, you will find many beautiful, large sandy beaches and small coves. Following the old paths, you will see windmills and watermills, dovecotes, monasteries and chapels, bridges, beautiful houses with flowered balconies and gardens. The famous specialty of the island, which you should taste during Andros holidays, is the “fourtalia”, scrambled eggs with sausages. However, it is really different from any omelet with sausages you have tasted until now. 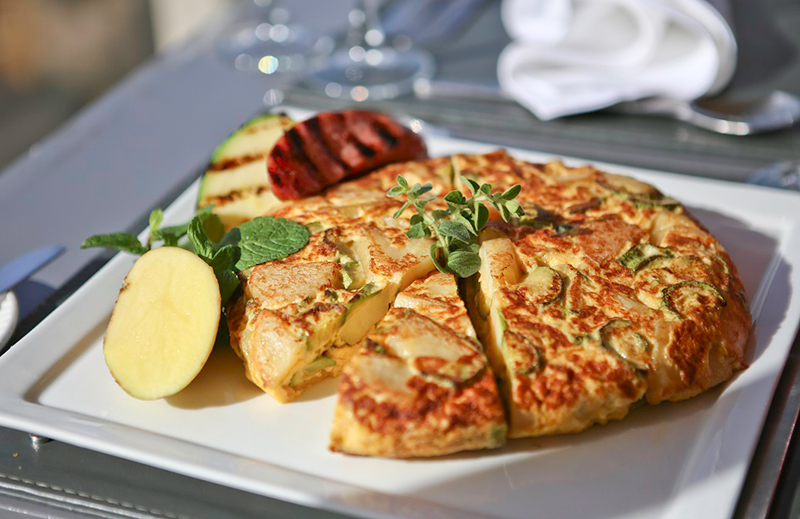 “Fourtalia” contains also potatoes and a portion, with its taste to be less intense than the normal omelet, without the strong flavor of the egg. You will find the best “fourtalia” in Andros Town, where is considered to be the original version. However, it is also worth trying this local dish in the “Balcony of the Aegean”, in Aprovato, near Batsi. It will be really difficult for you to choose which of the two is better: the flavor of this special recipe or the unique view of the Aegean. Apart from the food, during Andros holidays, you should also try the special local sweets, which you will find in Andros Town. 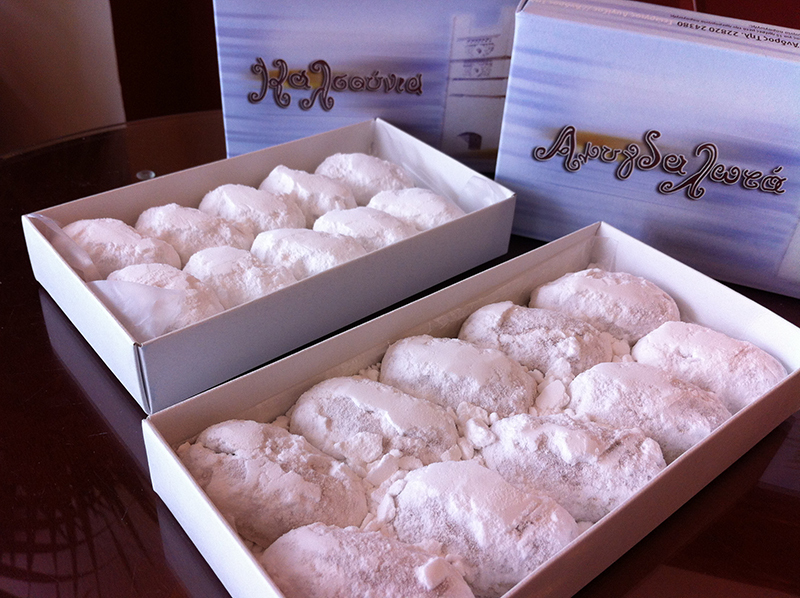 We would strongly recommend you the almond sweets, made in “Laskaris” shop since 1906. It is also worth trying “kalsounia” and “pastitsakia”. In “Ermis”, you will find really good ice cream and, in “Rodozachari”, really good homemade sweets. If you choose Andros holidays for this summer, you will discover a Cycladic island, different from the others. Andros beaches, the excellent food, the traditional villages, the archaeological sites and the unique atmosphere of the island, will captivate you.